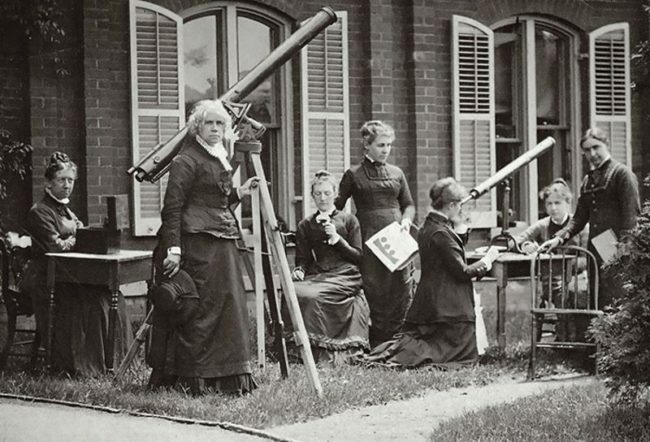 Maria Mitchell (second from left) and her students measure the Sun’s rotation from the movement of sunspots.Credit: Vassar College Library. It’s no secret that women have had to fight for equal rights and are still having to do so. History is a great reminder of how far women have come. Truth be told, women only gained most of their rights during the 20th century. When it comes to recognition, especially in male-dominated fields like science, technology, engineering and math, women are still fighting for equal representation and the acknowledgement of their pioneer work, although thankfully the landscape and culture around women’s achievements is changing. In the world of astronomy, it wasn’t any different either. In the early days of astronomical discovery, women were mostly employed as assistants to men who would take the lead (and later on much of the credit) for the painstaking tasks and projects being performed by women. In fact, women were not even allowed to operate telescopes until the first few years of the 20th century. This was just accepted as the norm back in the day. Because women have historically been erased or ignored when it comes to recognizing major achievements and breakthrough accomplishments, it only makes sense that we right the course of history and start giving credit where credit is due. 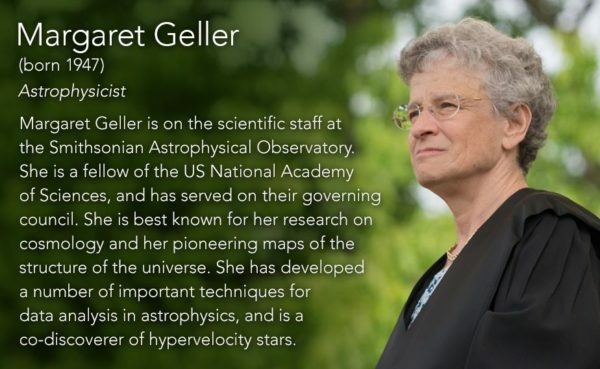 Below is a list of 15 exemplary female astronomers whose contributions to this particular field of science – whether finding a new planet, an asteroid or discoveries of astronomical events – far exceed the honor that was given to them. German astronomer and a sister (and assistant) to the astronomer who discovered Uranus – William Herschel – Caroline is the first ever woman to discover a comet. Over the years, she amassed seven comet discoveries to her name; including the periodic comet 35P/Herschel-Rigollet. 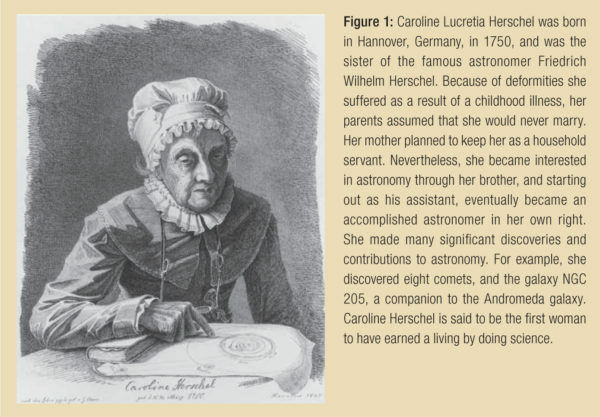 Caroline Herschel is also known to have been the first astronomer to catalog stars and nebulae. For the whole duration of her career, she was able to discover 14 nebulae – one of which is Messier 110. She, together with Mary Somerville, has been elected as Honorary Members of the Royal Astronomical Society in 1835; the first two women in history to have been in such a position. During her later years, she also received numerous awards; including a Gold Medal for Science awarded by the King of Prussia. Born in 1868, this American astronomer first started on a project that determines the brightness of measurable stars. This then paved the way to her discovery of the relations between period and luminosity of the Cepheid variable stars. This discovery was used (and is still being used) by astronomers to accurately measure space distances known as the period-luminosity relation. Born in 1943 in Northern Ireland, this astrophysicist started as a research assistant to astronomer Antony Hewish. Jocelyn Bell Burnell is instrumental in building a huge (81.5 megahertz) radio telescope that was later on utilized in tracking quasars. Jocelyn Bell is credited for having discovered pulsars; strengthening claims of the existence of rapidly spinning neutron stars. She was awarded the Special Breakthrough Prize in Fundamental Physics in 2018. After having been awarded as such, she donated the whole prize money to aid women and refugee students in becoming researchers of physics. 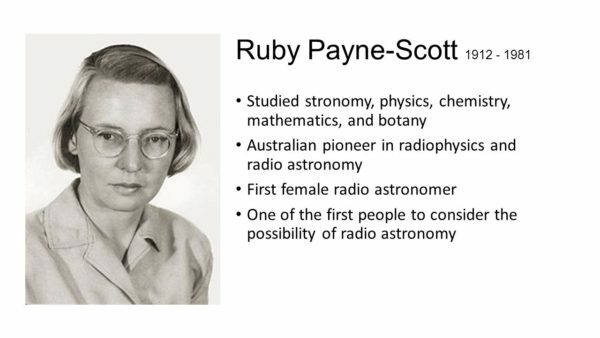 Considered to be the world’s first ever female radio astronomer, Ruby Payne-Scott’s astronomy career was never short of struggles. Born in 1912 in New South Wales, Australia, Payne-Scott grew up with much interest in Math and Botany. Upon graduation from high school, she was able to win a couple of scholarships at the University of Sydney where she tackled the logic of Math, the chemical compositions of Chemistry, the mysteries of Botany, and the laws of Physics. After finishing at the university, she went on to work at the Australian Government’s Commonwealth Scientific and Industrial Research Organization where she later focused on solar radio astronomy and discovered Types I and III bursts. She has also been instrumental in the discovery of Types II and IV bursts. Successful as her career may look like, she had been forced to keep her marriage to Bill Hall whom she married in 1944. It was more than 5 years later when she finally left the agency prior to giving birth to her first child that she finally used the name, Ruby Hall. Eleanor “Glo” Helin was an American astronomer who is known for her discovery (and co-discovery) of about 872 asteroids. Notable of her discoveries are the Aten asteroids, 2062 Aten, and 2100 Ra-Shalom. She was also the lady who discovered the Apollo Asteroids 4660 Nereus and 4769 Castalia. Add to that, she also co-discovered several comets – one of which is the 111P/Helin-Roman-Crockett. She was very much involved in planetary science and astronomy at the Jet Propulsion Laboratory and the California Institute of Technology for more than 30 years; starting a program called the Palomar Planet-Crossing Asteroid Survey (PCAS). The program has been the key to the discovery of several unique asteroids and comets worldwide. The Mars-crossing asteroid 3267 Glo had been named after her. 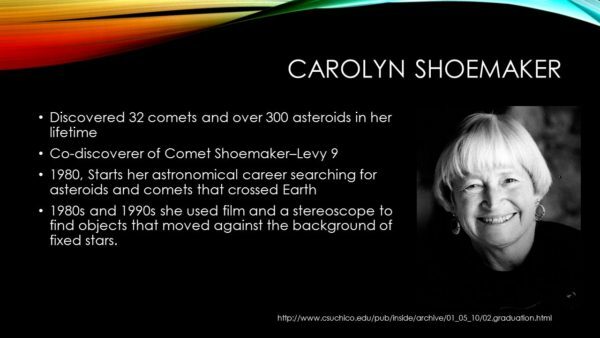 Carolyn Shoemaker is an American astronomer who is known to have discovered more than 30 comets and hundreds of asteroids. Born in 1929, she grew up to first study history, political science, and English literature. She then got married to Gene Shoemaker – a geologist who also got a strong interest in astronomy. After college, she served as a high school teacher for a year, after which she left her job to raise her three children. It was only after her kids grew up and left home when she found the time to help out her husband in search of comets and asteroids. It was at this time that she also served as a professor of astronomy at the Northern Arizona University. It was in 1993 when Carolyn, husband Gene, and comet hunter David Levy discovered the comet which was later on named as the Comet Shoemaker-Levy 9. The comet is known to have pieces of it colliding with the planet Jupiter in 1994 – putting up a spectacular night sky show amongst astronomers. For all of her contributions to this field of science, Carolyn was able to bag numerous awards including the James Craig Watson Medal in 1998 and the Scientist of the Year Award in 1995. An American astronomer, Maria Mitchell was born in 1818 in the US. She is known to be the first professional woman astronomer. Maria’s interest in astronomy was first influenced by her father who assigned her to rate chronometers for the Nantucket whaling fleet. At the time when women were not always seen with telescopes, Maria was given that liberty to use and operate one. She was educated in Massachusetts and right after college worked as a librarian (and a teacher) during the day. She continued watching the skies during the night. Later on she became the first woman to be elected to the American Academy of Arts and Sciences. Her big break came in 1947 when she first established the orbit of a new comet which was later known as Miss Mitchell’s Comet. After such a discovery, she was awarded a gold medal prize by King Frederick VI of Denmark; an award which is considered to be remarkable for a woman to receive at the time. She also pioneered the daily photographing of the sunspots which, at that time, were thought to be clouds. It was through this that led to the discovery that the sunspots were indeed whirling vertical cavities instead of clouds. Born in 1974, this American astronomer is known for her specializations in astrophysical instrumentation and infrared astronomy. She graduated with honors from Stanford University with a degree in Physics. Her Masters in Astronomy is from the California Institute of Technology; and a Ph.D. in Astronomy from the University of California. name of which is from Malala Yousafzai, a Pakistani who lived a life of activism; promoting girls’ rights to education. This specific asteroid is 4 kilometers in diameter and rotates around the sun every 5.5 years. Russian-born Lyudmila is known for discovering minor planets for the whole duration of her career. She graduated in 1959 from the Irkutsk State Pedagogical University and went on to work in the Time and Frequency Laboratory of the All-Union Research Institute of Physico-Technical and Radiotechnical Measurements in Irkutsk. According to The Minor Planet Center, Chernykh discovered 267 minor planets for the whole duration of her career; with most of these discoveries were a joint effort with her husband. Two of her most famous discoveries were the 2127 Tanya which was named after Tanya Savicheva – a Russian child diarist; and 2212 Hephaistos. American astronomer Vera Rubin was born in 1928 in Philadelphia, Pennsylvania. She is known to have pioneered work relating to the rotation rates of galaxies. Her greatest contribution in the field of astronomy was when she was studying the galactic rotation curves. She was able to uncover the difference between the predicted angular motion of galaxies and the observed motion. Vera was also the astronomer to provide evidence of the existence of a huge amount of dark matter in space. Although much of her career had been a struggle for her because of her being a female in a predominantly male world of astronomy, she was the first woman to be permitted to use the Hubble Telescope in the 1960s. It should also be noted that all throughout her career, she had been very outspoken and have always fought for gender equality in science. In 1993, she was awarded the National Medal of Science for all her scientific contributions in the field of astronomy. Born in 1953, American astronomer Carolyn Porco is known for her expertise on planetary rings and moons that revolve around planets like Jupiter, Saturn, Uranus, and Neptune. She is also known for her exemplary research that started in the 1980s with her work on the Voyager missions to these very same planets. She also leads the imaging team of the Cassini mission which is currently orbiting the planet Saturn. So far, her greatest discovery had been the giant geysers of icy particles on the 6th largest moon of the planet Saturn. This discovery indicates that there is water present on the planet. Born in 1925, American astronomer Nancy Roman started early in astronomy. Long before women dare not dream of being involved in science, she already started organizing an astronomy club at age 11 and went on to become one of the best in the field. After obtaining her Ph.D. in astronomy from the University of Chicago, Roman went on to become the first chief of astronomy of NASA. She was also the first ever woman to hold an executive post in the organization. Her greatest achievement was her involvement in the planning and the development of orbiting telescopes – including the famous Hubble telescope. During her later years, she was referred to as the “Mother of Hubble” for such a contribution. Born in 1947, American astrophysicist Margaret Geller is known for mapping the universe to an understandable size. While the universe may be huge, this has not hindered her from reaching this goal as, during her career, she strived to map all that can be possibly mapped in space. Aside from being named as the cartographer of the universe, she also co-discovered the hypervelocity stars. Born in 1953, Debra Ann Fischer grew up to be an explorer of the stars. And just like any explorer, she and her team were able to locate numerous planets outside our solar system that orbit other suns. She was just about done with graduate school when she discovered the first extrasolar planet. In her quest for other worlds, she was also able to find similarities between our own and other solar systems in the universe. One such example is that other solar systems also contain multiple planets. Over the years, she was also able to encounter unique finds – one of which is a planet that has two suns. She teaches astronomy at the Yale University and is also involved in research on the detection of exoplanets. Growing up, we’ve all gone through a stage when we at least considered having an E.T. for ourselves. Ever since the beginning of time, it has always been a wonder whether there exist other forms of life outside our world. And while everyone is busy wondering, Jill Tarter sprang into action and made this search her lifelong career. She served as director of the Center for SETI Research; SETI being short for the Search for Extraterrestrial Intelligence. Although she has already retired without being able to contact anybody from outside our planet, her research and contributions for many decades have assisted current astronomers and scientists in continuing that quest to possibly find life in outer space.